We are able to fulfill carryout orders of pizza and wings from the Christian Way Cafe outside of business hours – just give us a call at 270-269-2434 first. NEW! 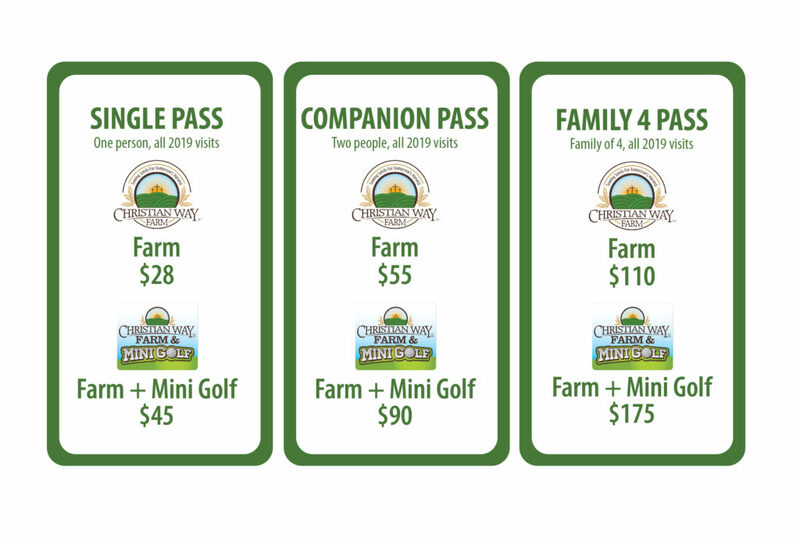 For our 2019 Season, we are offering Christian Way Farm season passes! Perfect for the frequent visitor, these season passes mean you can pay one price and visit us all year long. You’ll be able to experience bottle feeding calves in the spring, chugging around the farm on the lawnmower train throughout the summer, and enjoying the fall fun on the farm all for one low price. We offer several options for your family, and even offer a combo pass to accommodate families that want to add in mini golf to their visits. Find out more about our season passes or download the Christian Way Farm Season Pass Registration Form to turn in at the farm. Call us at 270-269-2434 for more information or to gift your purchase of farm fun. Pumpkins are NOT included in general admission or combo pricing. Whether picked from the patch or from around the barn, they may be purchased in the CWF store in the barn, or when available in the cafe or club house. Pricing for standard orange pumpkins are $2 to $7 in the patch. There are larger decorative pumpkins in the patch that will be priced differently than the orange pumpkins. Around the barn/store we also have larger pumpkins, decorative stacking pumpkins, gourds and other fall decorations (straw bales, large and mini), corn stalks and Indian Corn. An additional $5 (tax exempt) per person. $5.25 (Non-exempt) Can be paid separately for members of group who choose that option. Does not have to be purchased at entry. Please contact us for group rates. There are various options of adding other activities with your group visit. New to the farm in 2017 is GaGa Ball and some other options. Some groups choose to include that with mini–golf. Every birthday is special and every family has a different need. What we are learning that for many of you it’s simply that you want a place to bring your families to celebrate a birthday and you don’t require anything extra from us. That means you want to come play while we are open and simply use a picnic table to have your cake and open presents. With that being the case, we just charge a normal admission price and you are able to use our picnic tables and enjoy your party including your cake, food, and presents. We would ask that you call ahead and let us know–then if you have certain requests, we can discuss that then. And, by calling, we will know to expect you and can have the tables available for your use. Calling ahead also let’s us be sure we don’t have too many groups already scheduled at that time. We do have a limited number of fire rings and, for $25 additional fee, we can have a fire ready for your group to use. In the months of September and October, due to high demand for birthdays, there will also be $20 fee for party area if you choose an area separate from the fire pits. Company picnics, family reunions, class parties, or whatever event you are needing an outdoor setting. Please contact us to discuss these directly with Janie. We can discuss what your needs are and then determine if it fits the already scheduled events and what our fees would be.